How to implement combo's in my game. I am looking to implement combo's and juggling into this game. The main character can fly and platform as well, so combo's should be executable in air and on the ground. - How do I execute a combo on an enemy and register each hit with input buffering? - How is an enemy's hspeed and vspeed affected when I lets say perform a juggle? 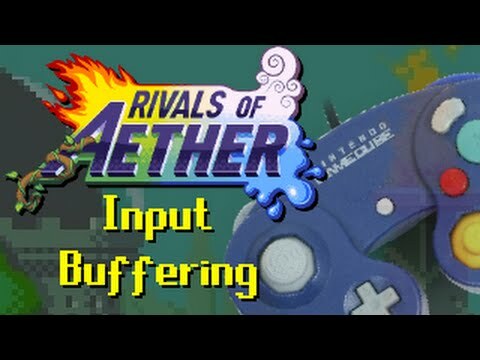 I didn't watch the video, but from a programmer's point of view for input buffering you can do something like this. There's of course an infinite number of ways of doing this. To get some cool feeling juggling, one of the tricks that many games do is have some time stutter on the hit. So the enemy that is hit temporarily pauses (and often the hitter pauses as well) so that the player has time to queue in the next attack in time to hit the enemy again. This way the player could be hitting the enemies away from them at a fair velocity, but if each attack move pretty quickly they can keep up with the enemy that they're hitting away from themselves. I guess I'm saying that some kind of time stutter is useful to give the player time to keep up with the action, and that way the action can happen at high velocities (instead of slowing the action down so that players can follow it). @critic and @EvanGreenwoodl, thankyou for the input, much appreciated! As a test, I made a cast spell when Q is check_pressed, the spell has 9 frames. obj_hit and obj_hit_last is created near the center of the spell sprite. When obj_hit collides with the demon object, the demon object's vspeed = -2 and when obj_hit last collides with obj_demon it's vspeed = 0 and it's hspeed is 30 sending the demon flying. Like Evan said, there are a wide variety of ways you could implement your system, but you should obviously choose one that best suits your needs. A constrained solution will be easier to create, a more complex solution could give you more flexibility. You're solution will be somewhere in the middle. However, I think what you need to do is break those questions into smaller ones so you can tackle them one at a time, and once you've made a prototype for each, then combine them into a bigger project (At least that's what I did for Shattered Realms). - How do I search through the buffer system to recognize correctly input moves? - How do I tell the game which input corresponds to which move? - How do I tell "moves" to listen for certain inputs, and when they recognize them, cancel into those moves? 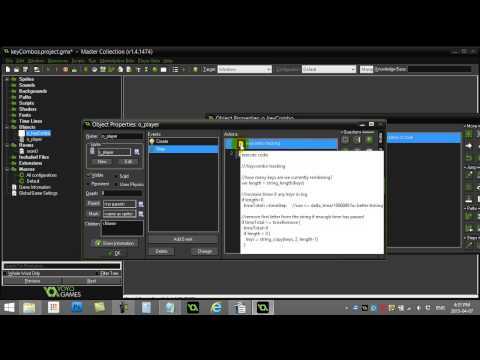 - How do I make a collision system using hit / hurtboxes? - What properties should hit / hurtboxes have and or track? - What are all the different states characters / enemies can have, and how do hitboxes affect them in these states. - If a hitbox lasts for more than 1 frame, how do I prevent it from hitting the same hurtbox twice? - How does collisions with platforms affect your hit / hurtboxes? - How do I incorporate (or track) hitstop and hitstun upon collision? As always, understanding the terminology of a genre can help with a lot of the questions. Hi @pieter, thanx for the input :D! How do I make an input buffer system? What I understand thusfar, is an attack has lets say 5 frames and the actual hit happens on frame 4 where the hurtbox is created. When I do a combo of lets say three moves, i would shorten each move's animation to 1 or 2 frames before the actual hit. Here, with input buffering, a move is executed and at a certain frame or couple of frames in that move one could input the next move and so on. The move completes and performs the next move afterwards. Like time windows for move execution when a previous move is executed. My question would be, instead of interrupting an animation (for a quick looking combo), how would one use the input buffer so that moves are linked and they complete their animations? I am uncertain about pressing a button and waiting for the move to execute. I have a obj_combo that keeps track of my combo input and removes the input over a certain amount of time. I'm not sure if there is a better way, the first combo executes and straight after the second combo, if input whilst the first combo still exists and the combo's only affect the enemy once, there is no remainder of damage taken whilst colliding with the combo sprite. 1.) If during a move the correct button is pressed for the following move (anywhere during the animation) you set a flag so that the current move knows it should cancel into that move at the end of it's animation. 2.) Assuming all moves return to some neutral state, you could also check if the correct button was pressed not just on the current frame, but say 6 frames back (which is what the input recording is for). So for eg. So when the Current Move finishes, and returns to your neutral state, you will check up to 6 frames back to see if a valid input was made. So 30-27 = 3, which means the next move will execute. 1 is more casual friendly since it makes inputs easier. Common in action platformers or action rpgs. 2 favours precise timing in order to link moves together, which can feel very rewarding for the player once mastered. More commonly used in fighting games and brawlers. Input_decay stores an initial value, say 120 (=2sec*60fps), that gets decreased by one each frame. At 0 I delete the input_decay[| i] entry and it's corresponding input_button[| i] entry. So to find out how long ago a button was pressed I just calculate 120-input_decay[| i]. The idea is that one executes a combo that starts some sort of flow for a longer technique. I guess there could be a bar that decreases and afterwards a 'mode' exits. Found this great article on hitboxes in GameMaker.